The Cumberland & Dumfriesshire Farmers Mart P.L.C. had forward 53 prime cattle, 45 over thirty month cattle, 6,055 prime lambs and 7,163 cast ewes & rams at their weekly sale at Longtown on Thursday 11th November, 2010. Prime cattle met another firm trade with Limousin heifers selling to a top of 170.5p from Messrs Ritson, Swaites purchased by Border Meats, Butchers, Lockerbie, others 166.5p Hallburn, 165.5p Brydekirk Mains, 164.5p Toppin Castle and Houghton House; Charolais 164.5p Hallburn, 163.5p Upper Mains and Hallburn, 159.5p Hallburn. Bullocks to 169.5p for British Blue from Toppin Castle; Limousin 168.5p Becton Hall, 165.5p, 164.5p, 163.5p, 161.5p Dashwell Green; Saler 163.5p Toppin Castle; Charolais 160.5p, 152.5p Fenton. Limousin bullocks to £1,137.38 Becton Hall, £1,127.85 The Haining House, £1,103.63, £1,093.93 Dashwell Green; Charolais £1,127.63, £1,113.75 Sceughdyke, £1,052.25, £1,051.28 Fenton Farm. Charolais heifers to £1,030.05 Upper Mains, £1,021.75, £1,018.53 Sceughdyke; Limousin £925.10 Toppin Castle. A better show of 45 fleshed cows were met by a brisk trade. Top price of 127.5p and 125.5p for British Blue cows from G. Mitchinson & Son, High Greenhill, 113.5p D’Mainholm; Simmental 121.5p High Greenhill, 111.5p Lowtodholes, 105.5p, 98.5p Morley Hill, 96.5p Englishtown, 95.5p Burnside. Top per head of £991.45 for British Blue from High Greenhill, £783.15 D’Mainholm, £771.38 High Greenhill; Limousin £759.38 High Greenhill, £747.88 Englishtown, £730.33 Lowtodholes. Cull bulls to £930.33 for British Blue from Morley Hill. A large show of lambs upheld recent high rates if under 44kg with a premium on under 38kg lambs for the Muslim festival. 4,448 lambs over 40 kg averaged 158.7p and 1,607 lambs under 40kg averaged 170.7p. The overall sale average for SQQ 165.49p. The sale was topped at 212p per kilo for Beltex from Newton Cottage and to £98.50 per head for Texels from Stackbraes, others £90.50 Cambwell, £88.50 Newbigging; Beltex £92.50 Hillside, £87.50 Westhills, £83.80 Mouldy Hills; Suffolk £82.20 Ashley Park, £81.80 Sceughydyke, £79.80 Upper Cleugh; Charollais £75.80 Leaona Villa, £70.80 Netherton and Pates Hill; Greyface £73.80 Newbigging, £70.50 Harelawhill, £69.80 Dalbhraddan; Lleyn £72.80 Hazelbank and Harper Hill; Cheviot Mule £72.80 Falnash, £69.20 Philiphaugh; Oxford £69.80 Guards; Hampshire £67.20 Dunnabie; Hill Cheviot £66.80 Commonside, £65.20 Kilbride; Swaledale £66.80 Kirkland Green; Kerry £65.80 Hazelbank; Leicester £65.80 Coldshield, £63.50 West Foreshield; Blackface £63.80 Lanehead, Spoutbank and Pitland Hills, £63.50 Brackenthwaite; Herdwick £58.80 Stackbraes; Jacob £55.80 Parks; Kendal Rough £55.50 Churchview. The 1,604 lightweight lambs sold to £65.50 for Texels from Maidencoates, £63.80 Bogside; North Country Cheviot £63.20 Killean; Beltex £62.50 Glencartholm, £56.50 Newington; Greyface £59.80 Arnicle, £57.80 Newington and Kildaloig; Blackface £59.20 Hott Farm and Barnglieshead; Hill Cheviot £59.20 Catslackburn; Suffolk £58.80 Ringliggate Cottage; Swaledale £57.20 High Edges Green; Jacob £51.50 Parks. Yet another monster show of ewes and rams were forward to a full ring of buyers and with the Muslim festival next Tuesday, ewes were £4-£5 head up on the week. The sale averages were 4,159 heavy ewes averaged £71.71, 2,763 light ewes averaged £46.23, 210 rams averaged £77.81. 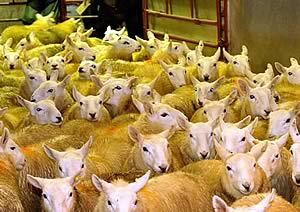 The sale was topped at £124.50 for a Texel ram from Roadside, others to £120.50 Cambwell, £120 Woodhouse; Suffolks £90.50 Hassendeanburn, £88.50 Tone Hall; Leicester £108.50 Moorside, £86.50 Whitton; Blackface £64.50 Stackbraes, £62.50 Alton Grange; North Country Cheviot £108.50 Nybster, £90.50 Easthouse, £88.50 Whitton; Swaledale £76.50 Spittal Shields, £68.50 Round Meadows; Beltex £83.50 Newton, £82.50 Mouldy Hills; Llynn £84.50 Overwhitlaw. Heavy ewes to £122.50 for Texels from Roadside, £120.50 Cambwell, £118.50 Roadside & Longlands Road; Suffolk £118.50 Nybster, £110.50 Cardew Hall, £108.50 Round Meadows; Charollais £116.50, £99.50, £94.50 Roadside; Halfbred £88.50 Adderston Shiels; Greyface £84.50 , £82.50 Townfoot, £78.50 Stackbraes, £76.50 Alton Grange; Cheviot Mules £94.50 Colmslie Hill, £75.50 Stackbraes, £69.50 Borthwicik Mains; Leicester £90.50, £86.50 The Close, £86.50 Sunnyside; North Country Cheviot £102.50 Waterfoot, £96.50 Nybster, £90.50 Waterfoot & Watling; Beltex £116.50 Mouldy Hills, £112.50 Roadside, £109.50 Mouldy Hills; Zwartbles £76.50 Colmslie Hill, £70.50 Hareshaw; Roussin £64.50 Stackbrae; Wensleydale £74.50 Watling; Easycare £66.50 Westerlea, £62.50 Kersheugh; Border Leicester £86.50 Waterfoot. Light ewes to £79.50 for Cheviots from Brantwood, £72.50 Commonside, £71.50 Sorbie; Blackface £67.50 Beachmenach, £66.50 Lanehead & Westhope & Ballybrennan; £64.50 Greyside; Swaledale £62.50 Minsca, £61.50 Nunscleugh, £58.50 Westerlea & Round Meadows; Herdwick £50.50 Brantwood; Jacob £49.50 Parks Farm, £47.50 Westerlea. Goats £70.50 , £68.50 Mossview, £60.50, £56.50 Roadside.